I lost my father and both grandfathers many years ago, but I’m so grateful and lucky to have been blessed with yet another father in my life: my stepdad. Not only does he make my mother so happy, he has been the most generous man and mentor to me since the day they met. Father’s Day is a bittersweet holiday for me, since I can’t celebrate with my own dad and grandfathers, but I am so thankful for my stepdad and will definitely be celebrating him! Not only is he an incredibly smart businessman who has given me LOADS of advice for my own business, he’s also a genuine family guy – he’s always the first person to suggest a big get together with the entire family, whether that’s for the SuperBowl or 4th of July. He cares deeply for his kids, my sister and me included. He’s so much fun to be around and is constantly trying to make everyone around him laugh. The only problem is, I never know what to get him for holidays, Father’s Day included! What do you get the man who has everything? 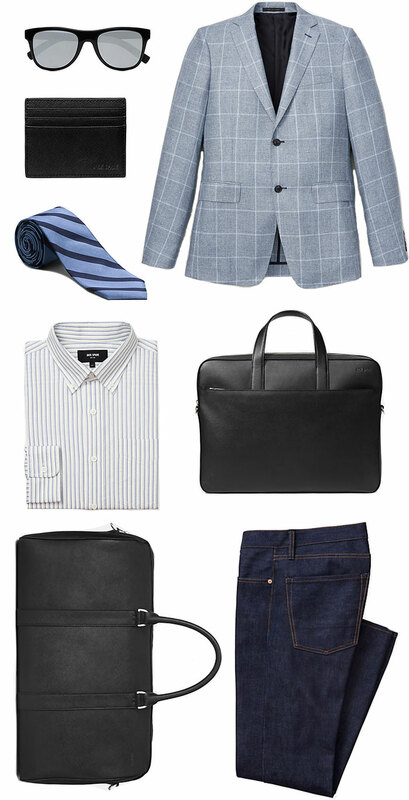 If you’re at a loss for what to get your own fathers, I recommend heading over to Jack Spade. They’ve got everything from crisp button-downs, sleek ties, and handsome jackets to essentials like classic briefcases, sunglasses, wallets and travel accessories. I’m thinking I’m going to get him this shirt and a new tie. Thoughts? It sounds like you have a wonderful stepdad! You’re so blessed! I lost my dad when I was in college and Father’s Day is always a little bittersweet for me too. But, I have an awesome father in law and husband so it’s fun celebrating them on this special day :) Love this gift guide. I never considered Jack Spade. I’ll have to check them out. Big hugs Merritt! Love that you can still celebrate with your stepdad. I don’t know why, but Jack Spade always slips my mind – such a great idea for Father’s Day! Your dad was one of my most favorite people ever!!! I loved babysitting you and your sister and visiting with your parents before and after. One of my favorite memories of him is when I was at an Admiral’s Ball, I think the year before being a princess when my sister was one, your dad and I danced the night away!!! I had just graduated from high school. Your mom was as sweet as ever and said she didn’t mind us dancing so much! He was the life of the party, as you know, and I miss him often! We had a special red-head connection, too! I love reading your blog and seeing what amazing talent you and your sister have! He would be so proud! I know he is watching over all of you! I’m so thrilled to hear that your step-dad is such a wonderful man for your mom and your family! What a blessing!!! Sending you love and hugs this Father’s Day! So sweet to read this – thanks for sharing. Love family and family values! Ah, I loved reading this, Merritt. I’m sorry your dad is no longer here, ut it sounds like you’ve been really blessed with your stepdad. Big hugs to you!